Who has made a t-shirt quilt? Thread: Who has made a t-shirt quilt? How hard are these to make? My dgd wants me to make her one. Any advice on this from those who have done one would be greatly appreciated. I've made a couple of them as commissioned works. I did not use a stabilizer but perhaps the t- shirts in question were of higher quality fabrics. I know the owners and have asked how they held up. Things are good years later. Creating a pleasing layout is the biggest challenge. Measure the design areas first and see how many of them can match up either width or length-wise. THEN cut them. I am a graph paper fanatic. And it works for me. Good luck! The only time I use intefacing on my T-Shirt quilts is if the fabric is very flimsy. Otherwise I just use them as is. Mine are also different than many by having multiple sizes cut. I use the method that Too Cool T-shirt quilts uses. Pieces are cut in increments of 4 inches (plus seam allowance) based on the design on that shirt. Pieces range from 4in X 4 in to 16X16. This will include non-square pieces also - 4X8, 4X12 etc.This makes for a very interesting T-shirt quilt. I then plan the layout based on shapes, sizes and colors of cut pieces. I will typically add a quilting cotton border and backing. As for quilting, I machine quilt on my domestic machine usually using invisible thread on the top. I do not typically quilt through any designs because the designs sometimes 'grab' the needle. I will outline quilt the design and letters (or the word if the letters are small) and then do some type of background quilting in the rest of the block. My background quilting usually varies from block to block. Link to one of the T-shirt quilts I have made. I made one for my DSIL using her racing tshirts. I had never made one before, but got some help from here. I knew I needed tricot interfacing and not Heat-N-Bond, but that was about it. I knew I didn't want to make just squares, I wanted something different. I chose a snowball with alternating nine-patch pattern. Not only was it alot of fun, but it was a great, positive learning experience. Quilting is my PASSION not my pass time. If Your DREAMS don"t Scare You...Then They Are NOT Big Enough!! !Dare to DREAM! I've made a couple of them, they're really not that hard. I stabilized the shirts, then cut the blocks out. The first one I tied, the second one I quilted, and used polar fleece for the backing. I had NO problems. I am working on one right now (my first)....since I am new to quilting and sometimes math challenged....I made all of my t shirt blocks the same size using a 15 inch square ruler (man sized t shirts XL). Bought Pellon fusible interfacing at Walmart and had no problems. If I can do it, anybody can do it. I am now working on my backing piece. I am putting a few smaller t shirt designs on the back in a few sections.....I might rethink that when I start quilting it all together. Hopefully I can post a picture when I get it done. I used fusable stabilizer on the back side of the shirts. I made one for my son. I stabalized each t-shirt square with fusible interfacing. 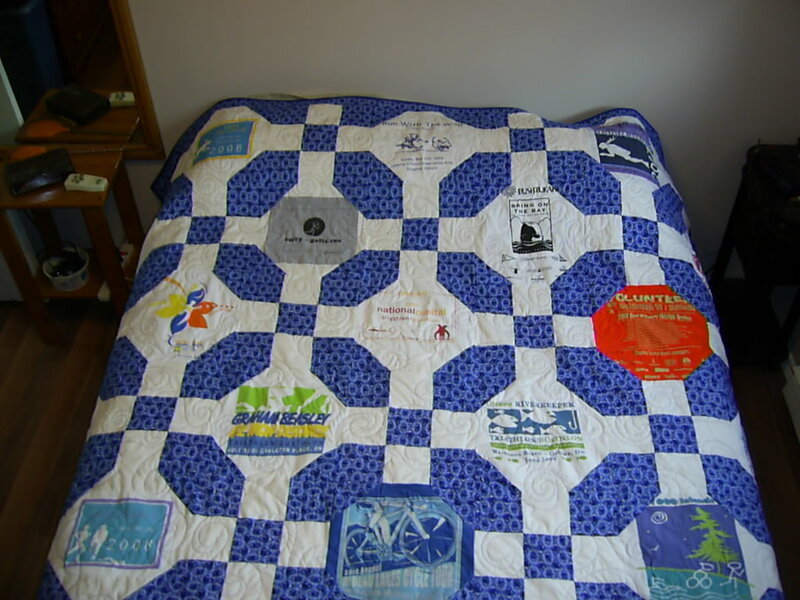 The quilt was extremely heavy but my son loved it. It was a labor of love and I don't think I would ever make another one.